I must admit, I didn't have high hopes going into Firefighters: The Simulation. When my first in-game day consisted entirely if driving around in a van, putting out literal garbage fires with a handheld extinguisher, I was ready to make some jokes. “How premonitory! Putting out garbage fires in a game that is itself a (figurative) garbage fire!”, I was ready to say. For better or worse, I don't get to take such shots - Firefighters: The Simulation is no trash fire. It's far from perfect, to say it's rough around the edges would be an understatement, but it's nonetheless an ambitious game. If anything, it feels like a prototype, in the sense that there's a framework for a really great game here - it’s just very, very incomplete. Firefighters: The Simulation is built around a simple loop that's oddly compelling: you get assigned a vehicle at the start of each shift, and then you wait around for a dispatch call. When one comes in, you race over to the site, check out what's happening, and (hopefully) fix the problem - before going back to waiting for the next call. The incidents you get dispatched to depend on your ride. You start out as trainee in charge of the survey vehicle, a van equipped with a standard fire extinguisher and a remote-controlled robot. Most of the tasks are small, easily-contained fires, like shorted out substations, hay bales set alight for a prank, and burning rubbish. If you're lucky, you'll get called out to an illegal waste disposal, where you get to use your robot to collect and analyse potentially toxic spills. As you complete jobs, you earn points and rise through the fire service ranks. Naturally, that seniority comes with more responsibility: bigger trucks and more dangerous jobs. It doesn't take too long before you're carrying people out of burning buildings and looking for sources of radiation with a hazard suit and Geiger counter. In the interests of simulating life as a firefighter, Firefighters: The Simulation has you going through all the minutiae of a job. Even for an “exciting” job like a burning building, you have to go through the mundane realities of finding a suitable parking spot, opening the hatch on the truck, grabbing the hose, and connecting it to the water tank before you can even think of being a hero. Then, when it’s all done, you need to clean up – find a mark and hazardous spillage, clean up non-toxic damage by siphoning into containers or drying it out with a special absorbing powder, and so on. You have to mind your vehicle’s petrol and water levels, and wash it down back at the station after a job well done (or done poorly). 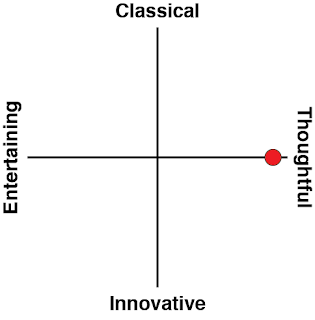 It’s rote, it’s repetitive, it’s “boring”, but I honestly think that’s the most interesting part of this game. It’s far from realistic (more on that shortly), but it does manage to capture the feel of being a firefighter – at its most exciting and its most dull – in a way that’s quite captivating. Even the waiting in between dispatches feels purposeful. You’re a firefighter on patrol, never knowing when a call might come in but needing to be ready to go. You drive around aimlessly, or you park up somewhere central and wait for your cue. And you wait some more. You check your (real life) phone, distract yourself with (real life) games, books, and what have you – just as I imagine a real-life firefighter would when they’re waiting. Then you get called up, and you drop everything else and head out to the job. It might seem a small, pointless part of the game’s loop, but in these moments of waiting – when I wasn’t necessarily playing the game, but had a constant eye on it, always alert – Firefighters: The Simulation was at its most lifelike. But, like I said, it feels like a prototype. That core loop is in there, and working well, but the rest of the actively destroys any hint of simulation or realism. There’s the superficial stuff, of course, like poor graphics and minimal sound effects, but Firefighters: The Simulation has some much more glaring problems. Chief among them is the fact that you can’t crash into cars or people – you just drive through them. 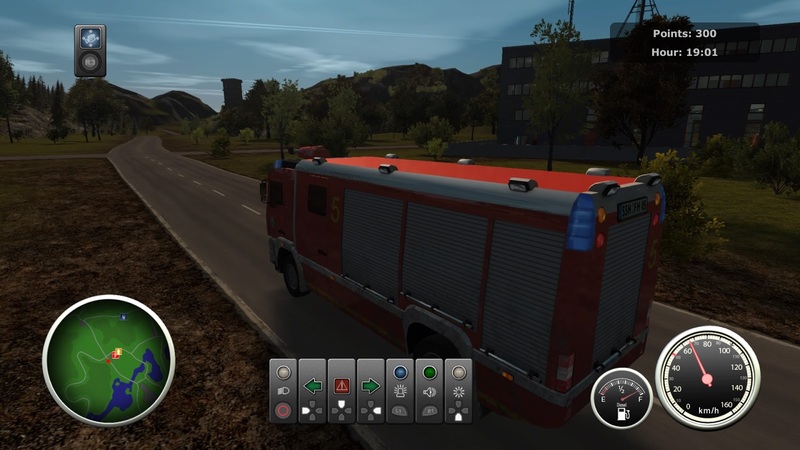 Balancing urgency with safe driving is such an important part of any sort of emergency services work, but Firefighters: The Simulation gives you no reason to drive carefully. You can’t damage your vehicle, you can’t injure people if you get reckless, you can’t go wrong at all unless you drive into a lake or get your truck stuck on a piece of the environment. There’s also no sense of urgency, because as far as I can tell, fires always patiently wait for you to put them out. When a call comes in, you get a very generous time limit in which you need to get to the scene, but once you’re there, the pressure’s off. 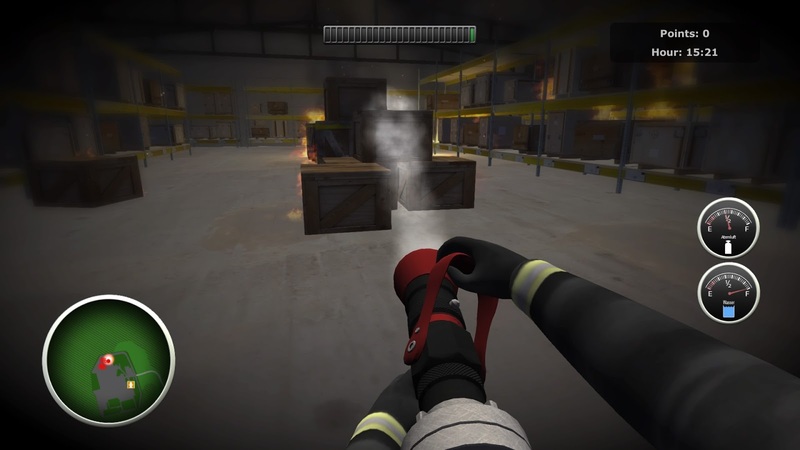 Take your time, do what you need to do – the fire, the toxic waste, and the injured civilians will wait for you. 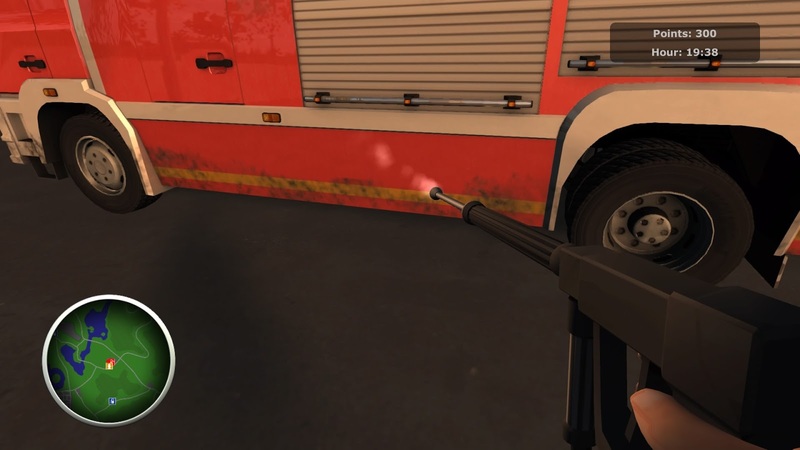 It all makes for a strangely relaxing game, which isn’t what I’d expect from a firefighting simulation. It’s also riddled with more minor issues that build up to create a game that feels unfinished. 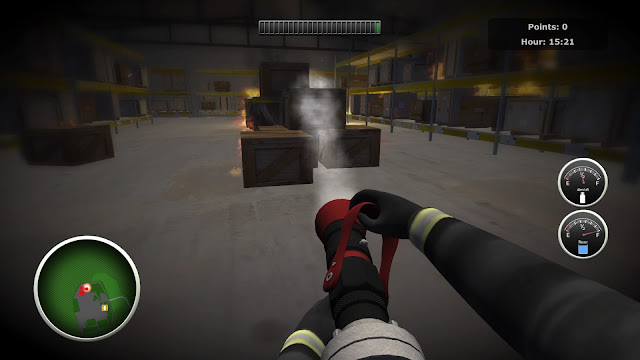 The UI takes some getting used to, the controls are a clunky, and despite a very lengthy tutorial, a lot of simple things – like changing the zoom level on the minimap – are left for the player to discover themselves. There’s not a lot of text, but the writing leaves much to be desired nonetheless. A better save system wouldn’t go amiss, and the process for ranking up could use some work. Firefighters: The Simulation is a long way from being a great game, and in the state that its in now, I wouldn’t even call it a good game. 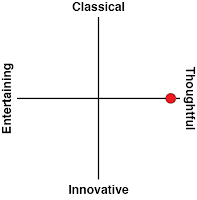 But if you can look past its flaws, you’ll find a framework for something quite fascinating. I just hope that updates, or maybe a sequel, eventually do that framework justice. 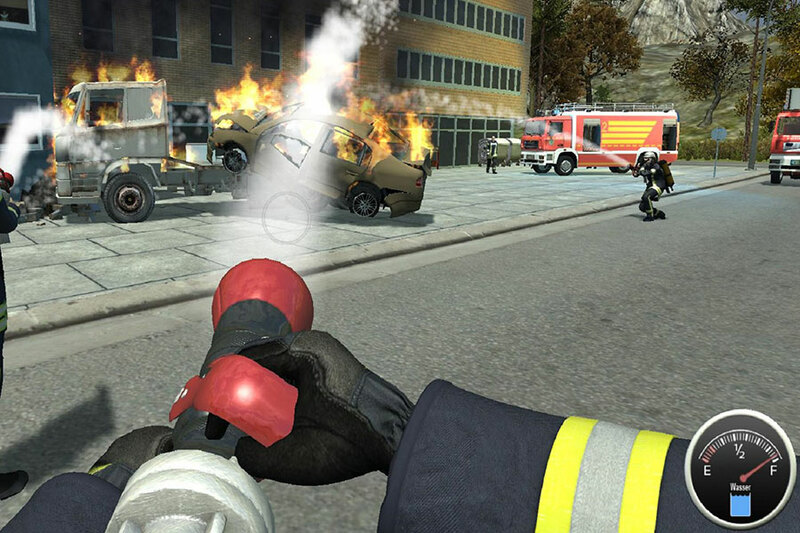 I’d love to see what a truly finished version of Firefighters: The Simulation would look like.